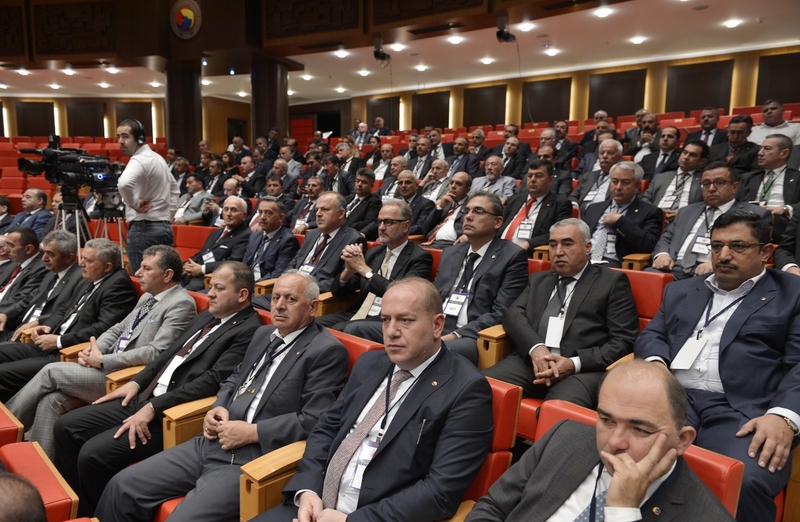 Soma Chamber of Commerce and Industry Chairman Hakan Işık and TOBB President M. Rifat Hisarcıklıoğlu attended the consultation meeting held with President Recep Tayyip Erdoğan in the Presidency Complex together with chambers and stock market presidents. ntısında TOBB President M. Rifat Hisarcıklıoğlu said that President Erdogan’s calm attitude towards this extraordinary situation and keeping the economy ahead of the difficult period also increased the morale and working calm of the business world. “We, as merchants and industrialists of our country, are determined to continue on the path without any interruption, for a stronger economy. We are going to make a drop on this frame, we will do it, “Hisarcıklıoğlu said, as a country and a nation, a great badire was overcome. Hisarcıklıoğlu stated that the danger encountered was not an ordinary coup attempt, and “His plan was to forever destroy the Great Turkey dream, which we have cut off in front of Turkey, which has once again risen, and we have proceeded with confident steps. I praise Allah. That night he came to the aid of this nation. The treacherous attack on July 15, the night of the terrorist organization of the FETO, came to a halt with the national resistance and the nationality initiated under the leadership of our President. Thank you God for making us a member of such a nation, “he spoke. Hisarcıklıoğlu pointed out that the TOBB community, the chambers and the cities of the stock exchanges, and the anti-junta counterattack are honorable martyrs, Hisarcıklıoğlu mentioned that the mosque gave a martyr in this process. Hisarcıklıoğlu gave the knowledge that the TOBB ETU student Ömercan Açıkgöz had martyred against darbacılar while fighting at the presidential mosque. “Unless we read the piracy coup d’état, we immediately announced our attitude towards the democracy and the national arena to the whole country via internet and TV. For the democracy to be held in the 81 provinces and 160 districts of our Chambers and Commodity Committees, members of the profession committee members, including SMS messages were sent to 85 thousand people. The next day on 16 July we went to our veterans’ parliament. The President of the Assembly, condolence visit to the political parties. By participating in the historic session on the occasion, we have shown that we are in favor of democracy as a Turkish business community. On July 19, we demonstrated our reaction against the coup together with 365 rooms and our stock exchange in 81 provinces and 160 provinces simultaneously. We said ‘Democracy is indispensable, national will is our power, our brotherhood is our future’. 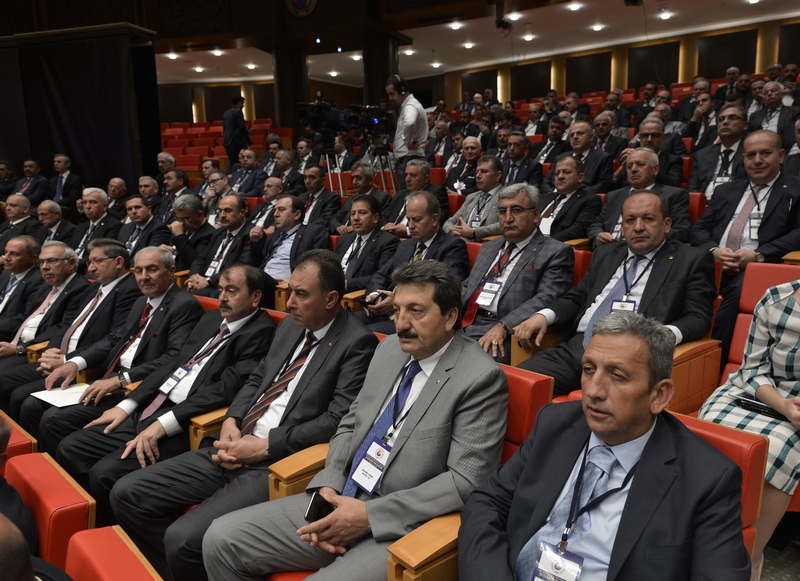 On 20 July we also visited the Turkish Grand National Assembly with 538 NGO representatives. We declared our ‘Democracy Commitment’ notice. We passed the theme with all of our foreign partners. We declared that our democracy and our economy are standing still, and that we should not worry about Turkey at all. On the other hand, as the Chamber of Commodity Exchange, Hisarcıklıoğlu emphasized that they supported the OHAL decision taken for the protection of public order and for the efficient processing of services. He explained that in this difficult period everyone needs to be a nation to help the state. TOBB President Hisarcıklıoğlu also announced that they will make an important contribution to the solidarity campaign for the martyrs and veterans that the state has initiated as TOBB-Oda-Borsa mosque. “In a nutshell, this community has become a democracy and a fund. After that, we will be at the disposal of our nation, beside our State, “said TOBB President,” We will try to make this nation richer. Now we have to do bigger things than his ex. We have to provide more investment, employment, export. I hope that with your support, we will overcome all these pitfalls and put our country among the top 10 economies in the world. As TOBB and Oda-Borsa mosque, we will continue to be in favor of democracy, nationality and our state tomorrow as it is yesterday. President Recep Tayyip Erdogan said in his speech here, “No doubt, July 15, this nation is an attempt to leave the country without stateless, stateless, stateless, because the treacherous network in this initiative used neither the nation nor the flag nor the state. .
Erdogan spoke at the Consultation Meeting with the Chambers of the Chambers and Stock Exchanges held in the Presidency Complex. President Recep Tayyip Erdogan said, “The people have been turning to the sobriety by saying they are the people, now everything is going to come to fruition, more things to come out, we have not put more points, this is a virgin. We are. ” said. The nation said on July 15, “We have no other country from this country, and we will not leave this country to these perverts.” President Erdogan said that the people of that night, origin, mespre, poured into the streets without regard to the party difference and said, “We do not have any more trust than unity, solidarity and brotherhood.” He also reminded me. Emphasizing that this was never a reflex of inward closure, Erdoğan said that he visited Oğuzhan Yaşar’s family who was injured 19 days in the hospital of TOBB last night but was killed. President Erdogan noted that AHİN is not only the person who does the work, produces it, is the person who performs the art, and at the same time he is the person who builds the future and the country, the nation, the country, the struggle with the heart and the heart. Erdogan, tradesmen, artisans, business people on July 15, demonstrated the strong position, the struggle to convey the fact that know. Erdogan expressed his gratitude to the millet, thanks and gratitude that he could be expressed by increasing the welfare by carrying the economical continuously forward. 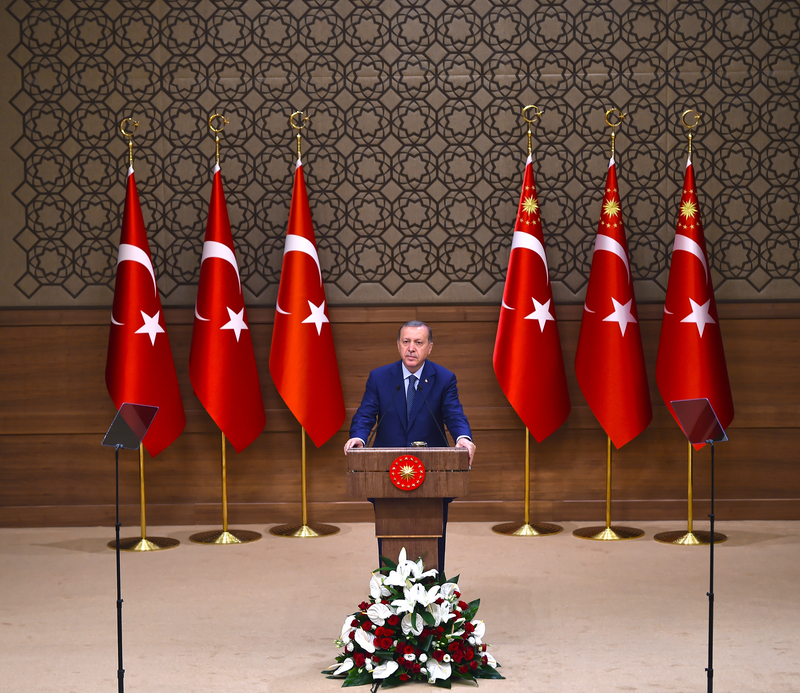 Emphasizing that the chiefs of the chambers and stock exchanges had important duties, Erdoğan reminded that the chairmen of the chambers and stock exchanges are the sectors where the businessmen came together most frequently and consulted. Recalling that the international camian came together with the top executives in Turkey and the “High Level Economy Meeting with International Investors”, Erdogan stated that they are in urging businessmen to increase their investments further. Erdogan said that they are continuing investments and they are waiting for good news about new investments. “I am counting on you as the owners of the economic success that has generated 7.3 million new jobs since 2007, when the global crisis was deeply experienced,” he told chamber and chief executives. Erdogan said, emphasizing that there are no problems and troubles in Turkey’s economic indicators. Erdogan said that the borrowing interest rate had fallen from 63 percent to 9.3 percent as of June. Erdogan said, “Despite the coup attempt, we do not have any trouble with international financing, on the contrary, even demanding borrowing auctions after July 15th, the demand for foreign exchange reserves in Central Bank has increased to over $ 125 billion. Central Bank to reach foreign exchange reserves. ” He spoke in the form of. Soma Ticaret ve Sanayi Odası Yönetim Kurulu Başkanı Hakan Işık, TOBB Başkanı M. Rifat Hisarcıklıoğlu, oda ve borsa başkanlarıyla birlikte Cumhurbaşkanlığı Külliyesi’nde Cumhurbaşkanı Recep Tayyip Erdoğan ile düzenlenen istişare toplantısına katıldı. TOBB Başkanı Hisarcıklıoğlu, “TOBB ve Oda-Borsa camiası olarak, dün olduğu gibi yarın da, demokrasiden, milletimizden, devletimizden yana olmaya devam edeceğiz” dedi. ntısında bir konuşma yapan TOBB Başkanı M. Rifat Hisarcıklıoğlu, Cumhurbaşkanı Erdoğan’ın bu olağanüstü durum karşısındaki soğukkanlı tavrının ve bu zor süreçte bile ekonomiyi ön planda tutmasının iş dünyasının moralini ve çalışma şevkini artırdığını söyledi. “Bizler, ülkemizin tüccar ve sanayicileri olarak, daha güçlü bir ekonomi için, hiçbir kesintiye uğramadan yola devam etmek azmindeyiz. Bu çerçevede üzerimize düşeni yapıyoruz, yapacağız” diyen Hisarcıklıoğlu, ülke ve millet olarak büyük bir badire atlatıldığını ifade etti. TOBB camiasının, oda ve borsaların il ve ilçelerinde, cunta karşıtı mücadelenin şerefli birer neferi olduğuna işaret eden Hisarcıklıoğlu bu süreçte camianın bir de şehit verdiğinden söz etti. Hisarcıklıoğlu, TOBB ETÜ öğrencimiz Ömercan Açıkgöz’ün darbecilere karşı, Cumhurbaşkanlığı Külliyesi mevkiinde mücadele verirken şehit düştüğü bilgisini verdi. “Korsan darbe bildirisi okunur okunmaz, demokrasiden ve milli iradeden yana olan tavrımızı, internet üzerinden ve TV’lerden tüm ülkeye hemen duyurduk. Demokrasiye sahip çıkılması için, 81 il ve 160 ilçede Oda ve Borsalarımızın meclis üyesi, meslek komitesi üyeleri dahil 85 bin kişiye SMS mesajı attık. Ertesi gün 16 Temmuz’da gazi Meclisimize gittik. Meclis Başkanımıza, siyasi partilere taziye ziyaretinde bulunduk. Meclisteki tarihi oturuma katılarak, Türk iş dünyası olarak demokrasiden yana olduğumuzu gösterdik. 19 Temmuz’da 365 Oda ve Borsamızla birlikte darbeye karşı tepkimizi, 81 il ve 160 ilçede eş zamanlı olarak gösterdik. ‘Demokrasi Vazgeçilmezimiz, Milli İrade Gücümüz, Kardeşliğimiz Geleceğimizdir’ dedik. 20 Temmuz’da da 538 STK temsilcisi ile TBMM’yi bir kez daha ziyaret ettik. ‘Demokrasiye Bağlılık’ bildirimizi deklare ettik. Yurt dışındaki tüm muhataplarımızla temasa geçtik. Demokrasimizin ve ekonomimizin sapasağlam ayakta olduğunu, Türkiye’ye yönelik hiçbir endişe duymamaları gerektiğini bildirdik. Öte yandan Oda-Borsa camiası olarak, kamu düzeninin korunması ve hizmetlerin etkin bir şekilde işlemesi için alınan OHAL kararını desteklediklerini de vurgulayan Hisarcıklıoğlu, bu zor dönemde herkesin devlete yardım etmesinin millet olmanın gereği olduğunu anlattı. TOBB Başkanı Hisarcıklıoğlu, devletin başlattığı şehit ve gazilere yönelik dayanışma kampanyasına da, TOBB-Oda-Borsa camiası olarak önemli bir katkı sağlayacaklarını bildirdi. “Özetle bu camia, demokrasiye ve sandığa sahip çıkmıştır. Bundan sonra da, Devletimizin yanında, milletimizin emrinde olacağız” diyen TOBB Başkanı şöyle konuştu: “Bu ülkeyi, bu milleti daha zengin yapmak için çalışacağız. Şimdi eskisinden daha büyük işler yapmak zorundayız. Daha fazla yatırım, istihdam, ihracat sağlamak zorundayız. Sizin desteğinizle inşallah, tüm bu tuzakları aşacağız, ülkemizi dünyanın en büyük 10 ekonomisi arasına sokacağız. TOBB ve Oda-Borsa camiası olarak, dün olduğu gibi yarın da, demokrasiden, milletimizden, devletimizden yana olmaya devam edeceğiz. Cumhurbaşkanı Recep Tayyip Erdoğan da burada yaptığı konuşmada, “Hiç şüpheniz olmasın, 15 Temmuz bu milleti bayraksız, vatansız, devletsiz, bırakma girişimidir çünkü bu girişimde bulunan ihanet şebekesinin ne millet diye ne bayrak diye ne vatan diye ne devlet diye bir derdi yoktur” ifadesini kullandı. Erdoğan, Cumhurbaşkanlığı Külliyesi’nde düzenlenen Oda ve Borsa Başkanları ile İstişare Toplantısı’nda konuştu. Cumhurbaşkanı Recep Tayyip Erdoğan, “Milleti himmet diyerek soydular soğana çevirdiler. Şimdi her şey meydana çıkıyor. Daha çok şeyler çıkacak. Daha noktayı koymuş değiliz, bu bir virgüldür. Daha devam ediyoruz. Rehavet yok, gevşemek yok, kararlı bir şekilde bu süreci devam ettirmek durumundayız.” dedi. Milletin 15 Temmuz’da, “Bizim bu ülkeden başka vatanımız yoktur ve bu ülkemizi de bu sapıklara bırakmayacağız.” dediğini aktaran Cumhurbaşkanı Erdoğan, milletin o gece köken, meşrep, parti farkı gözetmeksizin sokaklara dökülerek “Bizim birlik, beraberlik ve kardeşlikten başka güvenecek dalımız yoktur.” dediğini de anımsattı. Bunun asla bir içe kapanma refleksi olmadığını vurgulayan Erdoğan, dün gece TOBB’un hastanesinde 19 gündür yaralı olan ancak şehit düşen Oğuzhan Yaşar’ın ailesini ziyaret ettiğini söyledi. Cumhurbaşkanı Erdoğan, ahinin sadece işini yapan, üreten, sanatını icra eden kişi olmadığını, aynı zamanda yeri geldiğinde ülkesi ve milleti için malıyla, canıyla, yüreğiyle mücadele eden, geleceği de inşa eden kişi olduğunu kaydetti. Erdoğan, esnafın, sanatkarın, iş adamlarının 15 Temmuz’da gösterdiği güçlü duruşu, verdikleri mücadeleyi yakından bildiğini aktardı. Erdoğan, millete şükranı, teşekkürü, minneti ekonomiyi sürekli ileriye taşıyarak, refahı artırarak ifade edilebileceğini dile getirdi. Oda ve borsa başkanlarına çok önemli görevler düştüğünün altını çizen Erdoğan, oda ve borsa başkanlarının, iş adamlarının en çok bir araya geldikleri, istişare ettikleri kesim olduğunu anımsattı. Uluslararası camianın Türkiye’deki en üst düzey yöneticileri ile “Uluslararası Yatırımcılarla Yüksek Düzeyli Ekonomi Toplantısı”nda bir araya geldiklerini hatırlatan Erdoğan, iş adamlarına yatırımlarını daha da artırma, hızlandırma çağrısında bulunduklarını belirtti. Erdoğan, devam eden yatırımların olduğunu, bunlarla beraber yeni yatırımlarla ilgili de müjdeler beklediklerini söyledi. Oda ve borsa başkanlarına, “Küresel krizin derinlemesine yaşandığı 2007 yılından bu yana 7,3 milyon yeni istihdam üreten ekonomik başarının sahipleri olarak sizlere güveniyorum.” diye seslenen Erdoğan, Türkiye’nin ekonomik göstergelerinde hiçbir sorun ve sıkıntının bulunmadığını vurguladı. Kamu borçlanmalarının vadesinin 2002’den bugüne 9,5 aydan 71 aya çıktığına işaret eden Erdoğan, borçlanma faizinin yüzde 63’ten haziran ayı itibarıyla yüzde 9,3’e gerilediğini ifade etti. Erdoğan, “Darbe girişimine rağmen uluslararası finansman konusunda hiçbir sıkıntımız yok. Tam tersine 15 Temmuz’dan sonraki borçlanma ihalelerine dahi beklenenin çok üzerinde talep geliyor. Merkez Bankasındaki döviz rezervimiz azalmak şöyle dursun artarak 125 milyar doların üzerine çıktı. Bizim süratle ilk hedefimiz 165 milyar dolara Merkez Bankamızın döviz rezervine ulaşması.” şeklinde konuştu. TOBB’a bağlı oda ve borsaların başkanları Cumhurbaşkanı Recep Tayyip Erdoğan ile istişare toplantısı öncesinde TOBB İkiz Kuleler’de biraraya geldi. TOBB Başkanı Hisarcıklıoğlu ile Gümrük ve Ticaret Bakanı Bülent Tüfenkci’nin de katıldığı toplantının ardından otobüslerle Cumhurbaşkanlığı Külliyesi’ne hareket edildi.